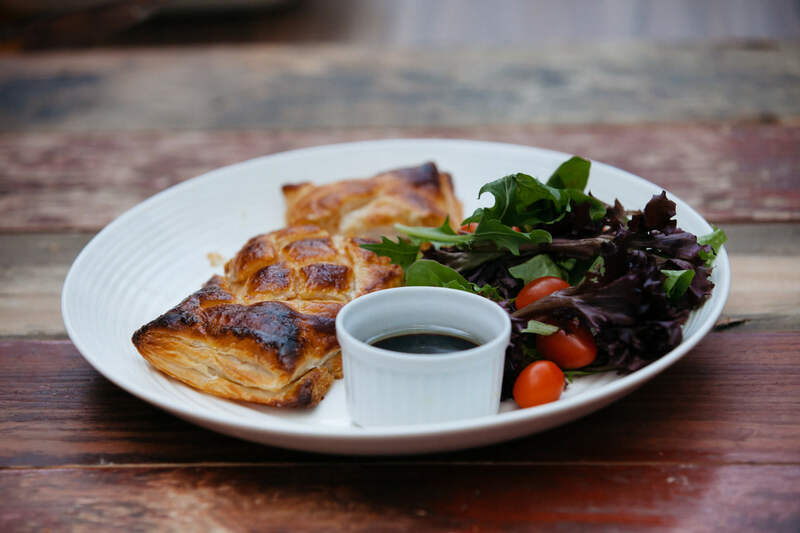 This show-stopper combines the gratification of the Chicken Wellington with the savoury flavours of Japan. We give you the best of both worlds, so this is going to be a merry meal for sure! 1. Cut each chicken breast into 2 pieces. 2. Wash and pat dry the chicken pieces. Marinate with miso (20g), ginger juice (30g) and olive oil (5g) for at least 30 minutes. 3. Preheat the oven to 220°C. 4. Sear chicken breast until slightly golden brown for 1 minute on each side. Let rest. 5. Make paste by frying the following ingredients with the remaining miso and butter: minced onion, garlic and ginger, bunashimeji mushroom, cooked quinoa, baby spinach, cream cheese, parmesan cheese and lemon juice and zest. 6. On a cutting board, roll and smooth out the sheet of puff pastry. Place the seared chicken in the middle of the pastry. 7. Scoop about 70g of the mix on the chicken, smoothing it out so that it does not spill over to the sides. 8. Fold the edges of the puff pastry over the chicken and the mix, starting with the longer sides, then the shorter ends. Trim excess and fold in the ends. 9. Brush with beaten egg. Score top with knife. Brush again with egg wash and bake for 15 minutes until golden brown.